I have just finished reading my top book choice for personal and professional development and am ready to delve into anything else by this mathematician and author! 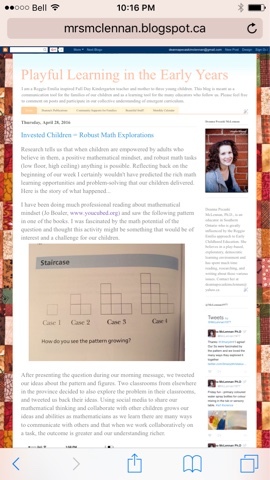 There were so many parts in the book that resonated deeply with me and I'm hoping to use this blog post as a way of sharing this learning with my blog audience - especially since so many educators have contacted me after reading our "Invested Children = Robust Math Explorations" post wondering just how it was possible the children were so engaged and interested in such a complex math task. 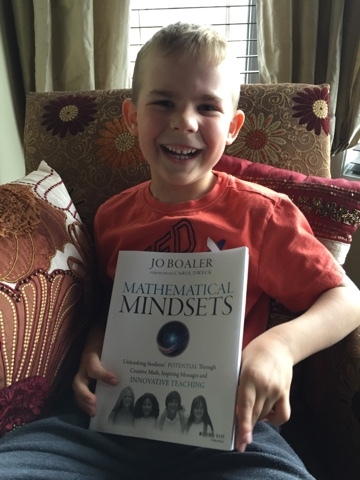 I have been so engrossed by Jo Boaler's Mathematical Mindsets over the last few months and can honestly say that it has helped me not only become a better educator, but better parent and math student myself. I am able to critically and reflexively look at situations through a mathematical lens and promote positive messaging and a growth mindset in these situations. Whether I am working on a math problem myself, engaging the children in my class in their math thinking, or inspiring my own children to consider and reflect upon their math experiences at school, I am a changed person in how I think about and act within math learning opportunities. This book has changed my life. I was so excited by Mathematical Mindsets and would often share ideas with my 9 year old daughter as we discussed how she could continue to learn and grow her math abilities. It was an amazing conversation piece, especially when she was getting frustrated with topics in math and felt like giving up. Caleb enjoyed all the pictures of the brain in it! If educators enjoy and appreciate math, they will model this to children who will then think positively about their mathematical experiences as well. Educators can also use this new attitude to help change those of their students' families and the greater community. Spending time creating an environment that is a community of learners who value each other as individuals who strengthen the group with their involvement and participation is essential. We learn better when we are together and it's okay to make mistakes because these are learning opportunities. 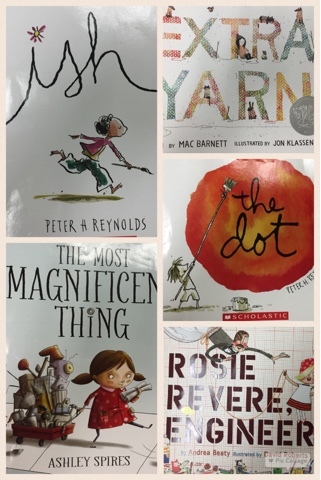 Many mentor texts helped us explore this idea with the children and consider what perseverance and resilience might look like in our classroom. 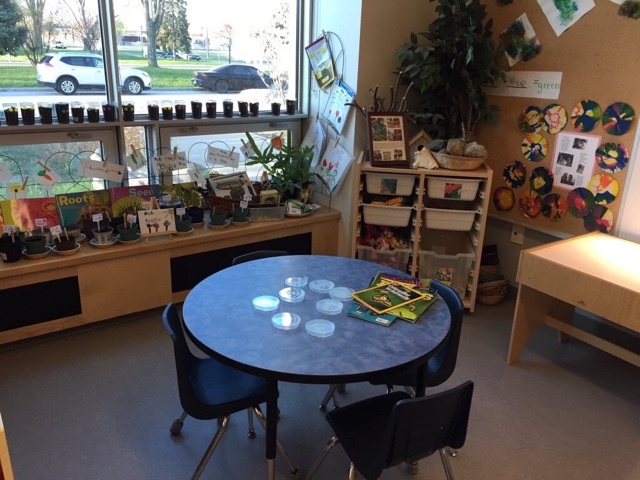 We also included many beautiful and inviting math books, materials and experiences into our learning centres in order to inspire children to collaboratively explore and create. Boaler asks educators to consider the following reflective questions to help us move from product-driven, isolated, performance-based tasks to rich, collaborative, meaning mathematics for children. 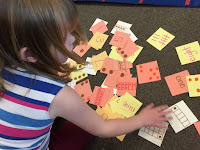 In my opinion these compliment the beliefs that many teachers also hold about developmentally appropriate, emergent, play-based practices leading them to be the perfect way to engage children in rich, robust math experiences in kindergarten. They naturally focus on process-based explorations and multiple ways of doing and knowing. They ask us to consider math from multiple perspectives and support and enrich content through meaningful ways of wondering about the world. 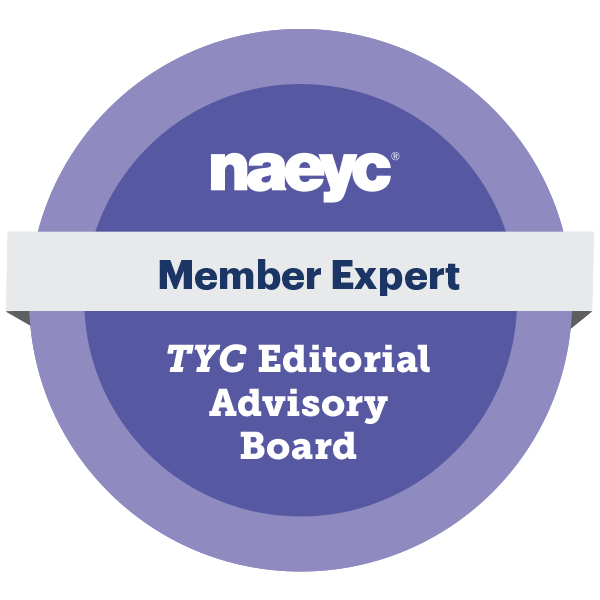 We naturally do this in an emergent, play-based classroom as we consider differentiated instruction and how to engage children in multi-faceted experiences that support preferred learning styles. Those influenced by Reggio Emilia think about the 'hundred languages of children' and how we can encourage and support children to explore a topic and also communicate their ideas and learning in new and innovative ways (e.g., drawing, painting, building, dancing). 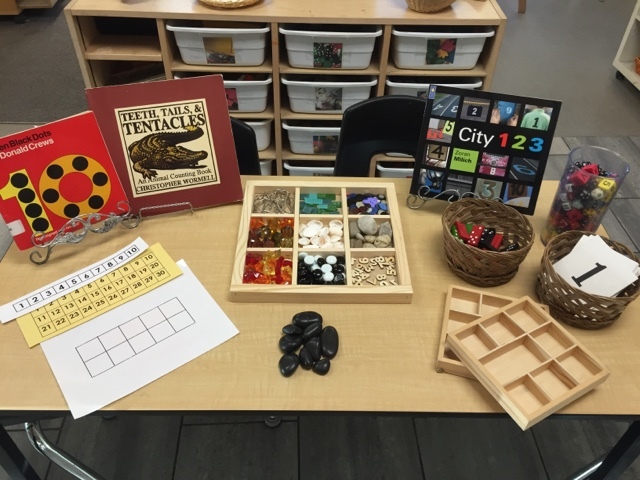 In our classroom we found that the loose parts, building, and art areas were rich with mathematical possibilities and because many children favoured these experiences, they also frequently explored and enjoyed math there as well. 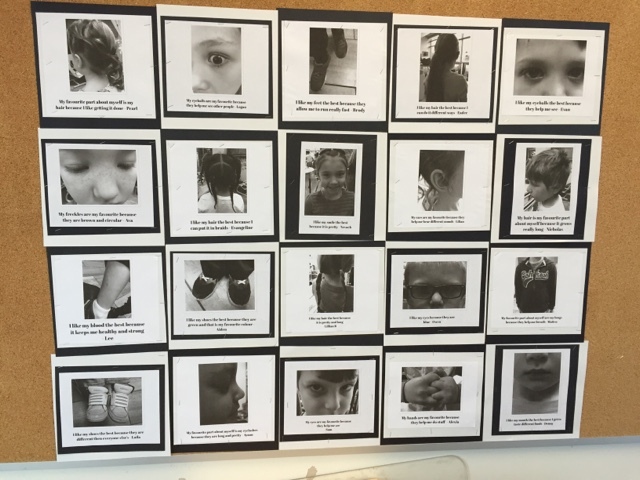 Inquiry is the heart of learning in the FDK, emergent curriculum classroom! When we honour children's questions and consider how to support their explorations we empower them as learners and members of an inquisitive community. 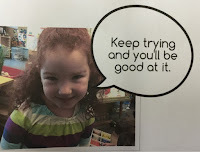 There were many inquiries in our classroom this year, and reflecting back on each I can see the math potential and just how motivated children were to answer self-directed areas of wondering. 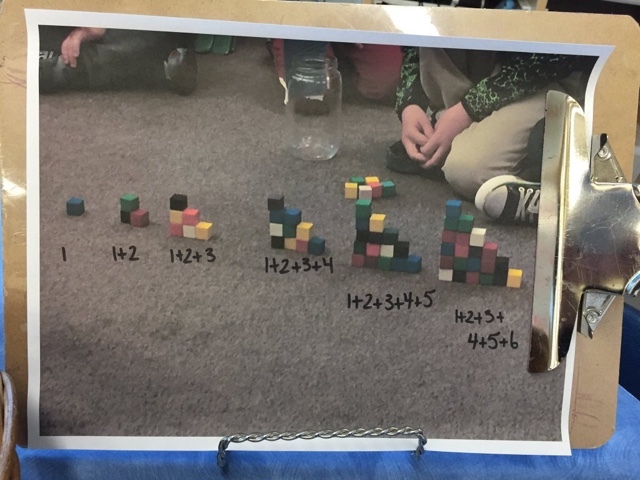 Look for how to weave math naturally into an inquiry, instead of presenting artificial math situations in order to empower your learners and grow their mindset. One of our richest inquiries was exploring how to help a local food bank that was in desperate need of items for the community. The rich math and language learning that emerged in this project is captured in the following video and article. Boaler suggests that the richest math teaching happens when there is a need to know how to solve the problem, instead of children being told math rules and procedures and then assigned practice questions out of context. In our room we are always open to using these 'teachable math moments'. 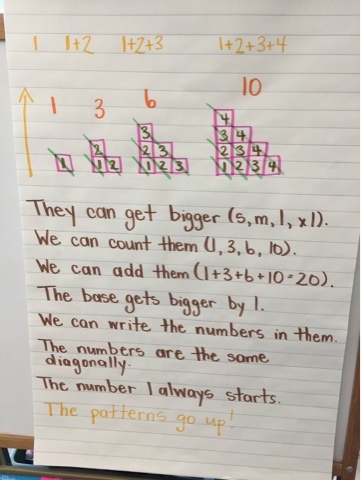 We conduct daily number talks, usually beginning with our sign-in question, and the different ways children wonder about how to arrive at a solution helps us meaningfully embed strategies into the experience. Playing along with children at the learning centres during playtime is also a very important way to accomplish this. As we play with children, we discuss what we are doing and are able and available to support and scaffold rich math learning as problems in the play arise (e.g., how to build a tower that doesn't fall over). 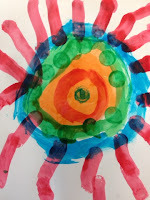 Because kindergarten children are emerging readers and writers, much of what we do in the classroom uses many other languages (e.g., drawing, painting, dancing, sculpting, building). 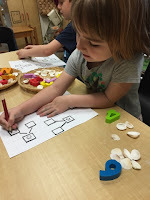 Our play activities naturally differentiate content and provide multiple entry points for children to use when exploring and communicating their discoveries to others. 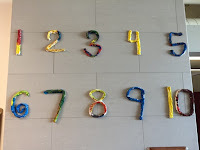 Math happens everywhere, not just the 'math centre'. 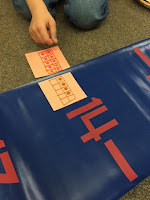 Children have a basket of subitizing cards (numbers 1 - 10) and are encouraged to match them on a number line with the numbers (10 - 20). 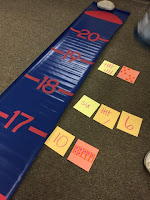 They can do a straight match (10 on the 10 spot), or add the numbers in interesting combinations (2, 3, or even 4 numbers to total a sum as represented on the number line). They can even think in terms of multiplication (3 groups of 6 can go on the 18). We have tried to observe, document and honour children's experiences in a variety of ways in order to make these visible to others. 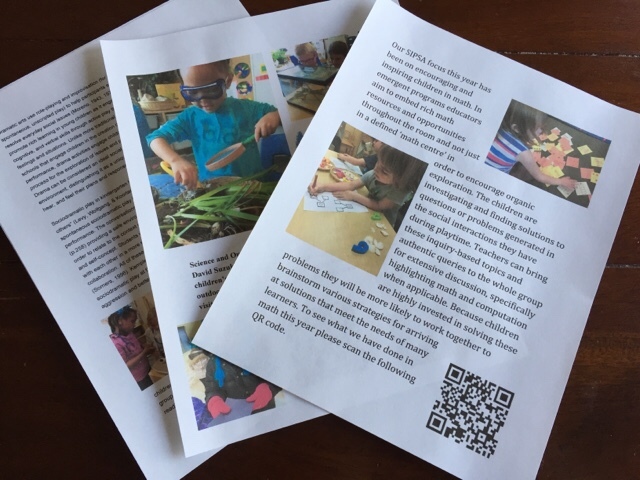 We have also used this documentation to help our own emerging understandings of the children's interests, strengths and needs and help drive our instruction forward as we better support the children's questions. We have used annotated photos and portfolios of children's work samples (art, drawings, writing, etc.). Each time we create an annotated photo story we send a copy home at the end of the day so that our families can be informed as to what has happened at school. This is especially important as some do not follow our twitter or blog and the portfolios are only sent home a few times a year. 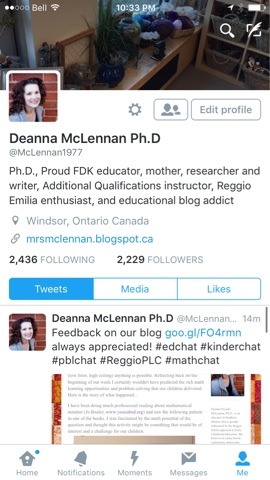 We want the rich, descriptive feedback to be ongoing and celebrated by families as well in order to continue to promote an interest in math and grow everyone's mathematical mindset. 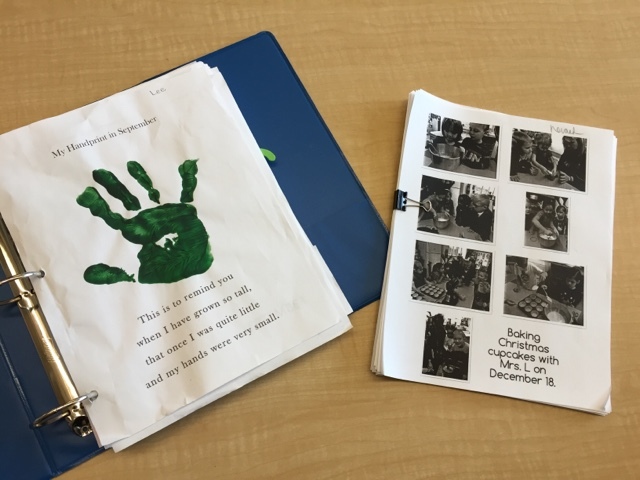 We keep copies of learning stories at each centre and posted around the room when complimenting other documentation so that the children and visitors to our space can review what's happened so far this year. The children enjoy looking through and reflecting upon their experiences. We also have pedagogical and research-based support visible in each centre as a way of articulating the reasoning behind the choices we make in the classroom. There is a QR code on each which when scanned leads the user to all blog entries tagged with that subject. This is our way of merging our digital documentation with the centre. 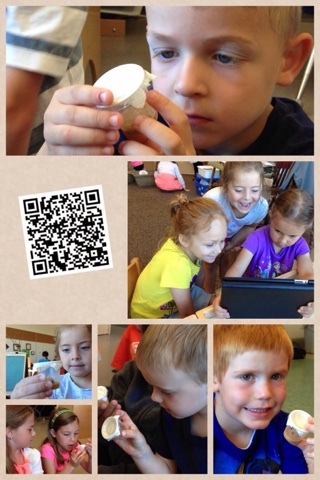 We also tag photo documentation with QR codes that lead the user to digital artifacts such as videos, voice recordings, blog entries, etc. in order to provide a more layered, meaningful presentation of the children's' inquiries and experiences. Especially with bigger math explorations we like to keep a running record on our easel of our math thinking and colour code the text and pictures to help us make sense of our journey. We continually refer back to this documentation and add/remove ideas as needed. 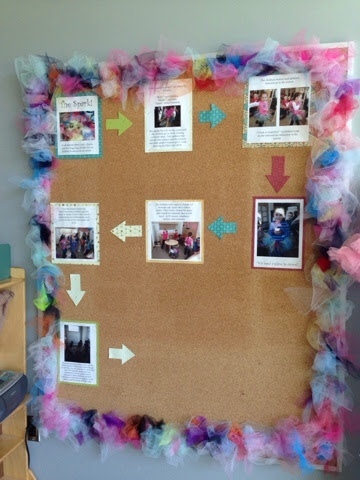 We use photo documentation and encourage children to write directly on the photos to help them consider alternate information and to help layer reflections on past experiences with their emerging understanding. 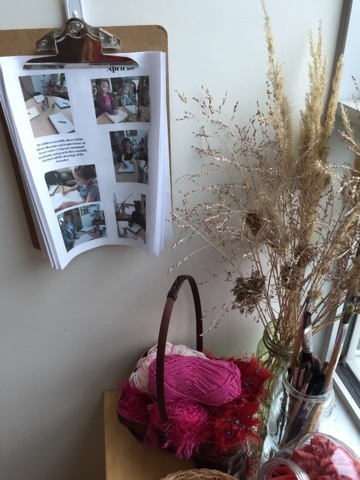 We build the documentation directly into our centres - photos, artwork, writing, physical artifacts from the inquiries, and many other representations of our ideas are woven throughout the classroom. Photos and writing on our walls show our journey and the progression of our ideas. We keep empty space available so we can continue to add to it as we progress on the journey. Consolidating our understanding, sharing what we have done and learned with a wide audience, and connecting with others in order to learn from them is a major part of our documentation. 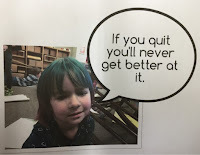 The children like to blog and tweet together with me and we've been able to connect with many classrooms from all over the province. It's exciting to know that there are others who are on the same journey as us, and as Boaler states in her book, math is a collaborative and social experience and we learn best when we work together with other like-minded individuals! The ending of Mathematical Mindsets was most powerful for me, and I'm going to revisit this paragraph many more times as I continue to expand my own mindset and continue to explore how to better implement meaningful math in an emergent program. 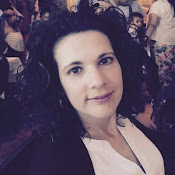 I would love to continue to connect with other educators interested in the same!